[center][font=Harrington][size=7][b]Alaia's Legacy Challenges[/b][/size][/font] [img]https://66.media.tumblr.com/07e1c7ac89be50df692657358be3c657/tumblr_inline_o21bmjI1M91r3lvtf_400.png[/img][/center] Been awhile since I have done a Legacy Challenge and I had a spare G1 Guardian who wasn't selling after a Mass Hatch so here we go. 3/13 Update: Adding another line because why not? This kid is fodder anyway. The last time I tried a Legacy Challenge I got way too specific with colors and genes and made it pretty impossible to find mates as I went along. I ended up trashing that one because it got to the point where it wasn't fun anymore. So this time I will be starting with a pretty broad goal in mind. [center][size=5][u][b]Goals:[/b][/u][/size] Triple Gem Gened Coatl or Wildclaw Line A: Going for Mint-Obsidian color ranges Line B: Going for Ice-Magenta color ranges [/center] ----- [size=4][u][b]Rules:[/b][/u][/size] [LIST] [*]Start with triple basic unbred G1 [*]Buy a mate 10kt or under treasure, each generation gets a 10kt budget increase [*]Breed them, choose an heir from the hatchlings, repeat until goal is met [/LIST] [size=2][url=https://www1.flightrising.com/forums/qnc/1021864]Original Rules Thread[/url][/size] I am modifying the rules slightly in that I am going to choose my own heir instead of having it be the first born automatically and I am going to keep breeding until meet my goal rather than limiting myself to 10 generations. (The limited to rare breed jump is going to hurt, I just know it) I will not be keeping point score since I made these adjustments, as it would affect the points too much. I also totally forgot about the "mate must be same flight as your starting dragon/heir" but at this point I don't care much. This is just for my own amusement really. ----- [size=4][u][b]Fun Facts:[/b][/u][/size] The successful result of my first ever Legacy Challenge (goal was XYY rip/cur/crack watery Guardian) She was born on the 5th generation. [url=http://flightrising.com/main.php?p=lair&id=63749&tab=dragon&did=7354026][img]http://www1.flightrising.com/rendern/avatars/73541/7354026.png[/img][/url] The super specific one I gave up on sometime around gen 6 was Iri/Shim/Lace Mist/Robin/Pistachio Coatl. That was like 2ish years ago and even now there are only 4 active dragons with those colors, none of which are Coatls. 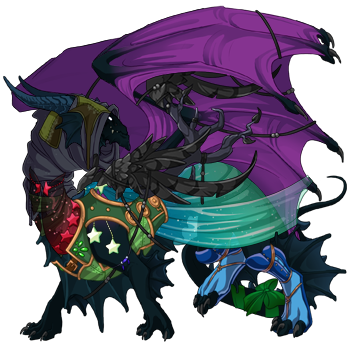 [s]Now that I strarted thinking about it again I may or may not have 3 pairs in my lair now trying to get me this dragon. [/s] I was doing okay getting genes, but even though I tried to shortcut by starting with a G1 Noc, even by Gen 6 I still hadn't managed to get into the Rare breed tier (which is why I am afraid of it now and am taking out the 10 generations limit). Been awhile since I have done a Legacy Challenge and I had a spare G1 Guardian who wasn't selling after a Mass Hatch so here we go. 3/13 Update: Adding another line because why not? This kid is fodder anyway. The last time I tried a Legacy Challenge I got way too specific with colors and genes and made it pretty impossible to find mates as I went along. I ended up trashing that one because it got to the point where it wasn't fun anymore. So this time I will be starting with a pretty broad goal in mind. I will not be keeping point score since I made these adjustments, as it would affect the points too much. I also totally forgot about the "mate must be same flight as your starting dragon/heir" but at this point I don't care much. This is just for my own amusement really. The successful result of my first ever Legacy Challenge (goal was XYY rip/cur/crack watery Guardian) She was born on the 5th generation. The super specific one I gave up on sometime around gen 6 was Iri/Shim/Lace Mist/Robin/Pistachio Coatl. That was like 2ish years ago and even now there are only 4 active dragons with those colors, none of which are Coatls. Now that I strarted thinking about it again I may or may not have 3 pairs in my lair now trying to get me this dragon. I was doing okay getting genes, but even though I tried to shortcut by starting with a G1 Noc, even by Gen 6 I still hadn't managed to get into the Rare breed tier (which is why I am afraid of it now and am taking out the 10 generations limit). Laid 4 eggs, got 1 baby with a gene, and 2 with a new breed. Laid 3 eggs, got 2 babies with genes and 1 with new breed. First nest hatched~ Some pretty good babies too! [center][url=http://flightrising.com/main.php?dragon=50276467] [img]http://flightrising.com/rendern/350/502765/50276467_350.png[/img] [/url] [url=http://flightrising.com/main.php?dragon=50276468] [img]http://flightrising.com/rendern/350/502765/50276468_350.png[/img] [/url] [url=http://flightrising.com/main.php?dragon=50276469] [img]http://flightrising.com/rendern/350/502765/50276469_350.png[/img] [/url] [url=http://flightrising.com/main.php?dragon=50276470] [img]http://flightrising.com/rendern/350/502765/50276470_350.png[/img] [/url][/center] Selecting the seafoam boy as my Heir because I want to get the breed up. First nest hatched~ Some pretty good babies too! Selecting the seafoam boy as my Heir because I want to get the breed up. aaaaaaa I'm gonna follow this thread! !